Once thought of as predominantly niche generalists, opportunistically scattered over reefs wherever larvae settled or propagules landed, sponges are increasingly recognised as being predominantly niche specialists with marked habitat preferences. Distinct species assemblages characterise particular habitats, although there are a number of ubiquitous species found vicariously throughout the reef. 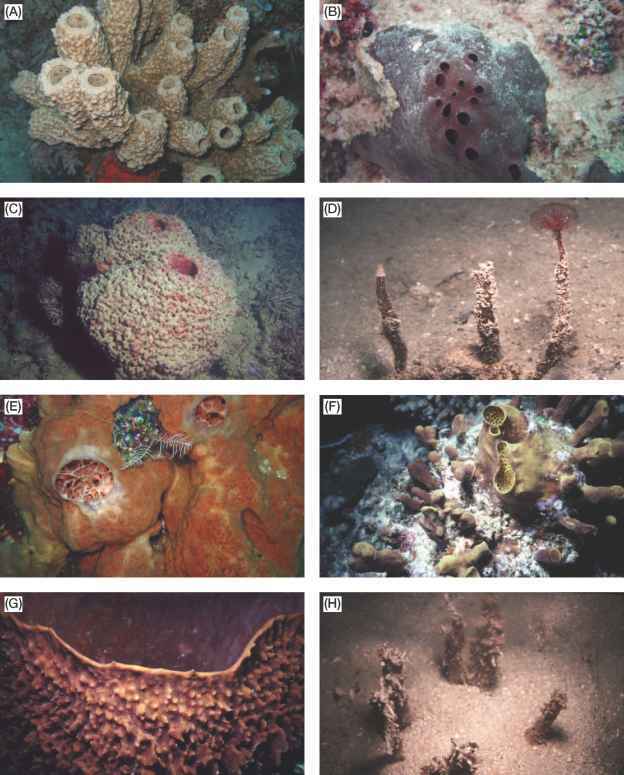 Some of the more prominent sponge habitats occurring on the GBR are described here. Of all the habitats, the reef flats and shallow parts of lagoons contain probably the most significant of the coral reef sponge faunas, at least in terms of their visibility and provision of ecological services. These are the pho-totrophic (or autotrophic) species, belonging primarily to two orders of Demospongiae, the Dictyoceratida and Haplosclerida, that derive most of their nutrition from the photosynthetic products of their resident symbiotic cyanobacteria, and in the process contribute significantly to overall net primary productivity of entire reef systems. 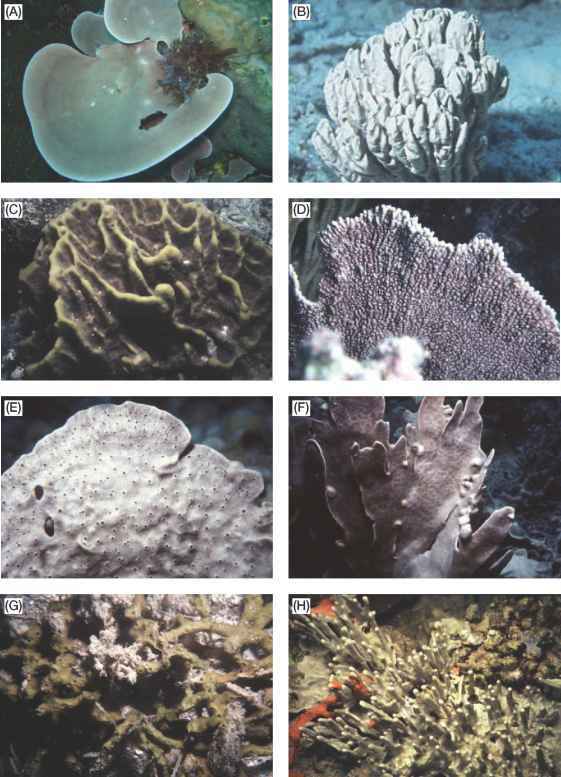 Phototrophic species (which derive most of their energy from sunlight through photosynthetic sym-bionts, see Chapter 7) include representatives from several orders, with the common species on the GBR being Phyllospongia papyracea, Carteriospongia foliascens, Strep-sichordaia lendenfeldi, Haliclona cymaeformis, Cymbastela coralliophila and Lamellodysidea herbacea (Fig. 17.1A-H). Some of these species can be found in very large populations, especially in the clear waters of outer reefs. These phototrophic sponges are also unusual in having (probably truly) widespread geographic distributions, appearing to be very similar on both sides of the continent, with some also common in the Indo-Malay archipelago and south-western Pacific islands, although no molecular study of these widespread populations has yet been attempted to test their alleged conspecificity. Another highly diverse fauna on the reef flat and in the lagoon shallows are the coral rubble, under-rubble and boulder sponges, living in crowded, encrusting and sciaphilic communities. These sponges range from thin crusts of no more than several millimetres in thickness, competing with each other for space and other resources using an arsenal of chemicals (Box 17.1 and Fig. 17.2), to massive slimy sponges that bind the coral rubble together and form the paving substrate. Examples of these include: Myrmekioderma granulata, Clathria aceratoobtusa, Leucetta microraphis, Aplysinella rhax, Neopetrosia exigua, Gelliodes fibulatus and Hyrtios erecta (Fig. 17.3A-H, Fig. 17.4A).